Historically, castile soap referred exclusively to the olive oil soap made in the Castile region of Spain, but today it's a term more broadly used to describe any soap made through the traditional saponification process that turns natural plant oils into soap. Castile soap is an everyday staple in my home for both body care and cleaning purposes and I've recently been trying out the soaps from a new-to-me brand, Dr. Jacobs Naturals. Dr. Jacobs is a cruelty free company making liquid castile soap in the USA without palm oil, synthetic fragrance, colors, preservatives, or GMO's. People often complain that liquid castile soaps are either too thin and runny or don't lather sufficiently, and quite honestly, these two factors frequently have me reaching for a different product in the shower too. Dr. Jacobs soaps, however, circumvent both these issues by thickening their coconut and olive oil based castile soap with a small amount of the gentle, non-toxic surfactant coco-glucoside. The result is a hybrid soap that's substantially thicker than your average castile offering. It won't pour out of your hands or run down the drain, and the coco-glucoside helps it to lather more easily too. I've been testing Dr. Jacobs' soaps out for all my usual household cleaning tasks -- laundry, makeup brush washing, and more -- and also as a shower gel and hand soap, and I'm pretty sold on them for all of the above! The thicker viscosity makes it the perfect consistency to use as either a body wash or hand soap and its gentle and non-drying on the skin. (And the 16 oz. pump bottles are extra convenient in the shower too!) The thickness also means that you don't need to use as much product, particularly for cleaning, so a smaller amount of soap goes farther too. I'm not personally a fan of castile soap for the face, but if that's something that usually works for you, I see no reason why Dr. Jacobs wouldn't as well. In terms of scents, Dr. Jacobs offers a good variety of both essential oil-based and natural fragrance options and I've been testing out three, plus the unscented. The Citrus, currently residing in my shower, has a very mild scent. It smells good and citrusy, but I also smell a little of the natural oils coming through. The Eucalyptus and Peppermint are much stronger scents and have some serious scent power. I used the Eucalyptus to clean my makeup brushes this week, while suffering through the tail end of a cold, and had the added bonus of clearer sinuses when I was finished. The Peppermint has been hanging out by my washing machine, and a small amount in the wash leaves clothes smelling minty and fresh. And the Unscented is, of course, great for when you don't want a scent, or for creating your own. 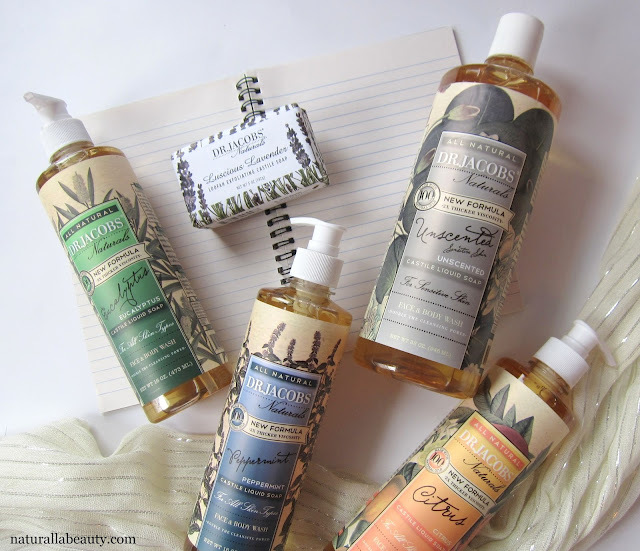 I always keep castile soap on hand and Dr. Jacobs is a great option! The liquid soaps are thick and skin-friendly, and create a rich, versatile lather to suit a multitude of uses -- both for the body and household/cleaning.